The LifeProof tough case for iPhone 4/4S offers serious protection from both rough impacts and nasty environments, but I've also found it to be great for everyday use. It's dirtproof, for protection from even fine micro-particles, so you can confidently use your device on a gritty windy beach, or off-road in a dusty plain. It's waterproof, to 2 meters (6.6 ft), so you can shoot photos underwater, or even listen to music with the waterproof headphone adapters. And you can still use your phone in bad weather or even in the shower. It's snowproof, since even melting snow and ice can't wick in through pooling or capilliary action. It's shockproof, providing shock and impact protection up to a drop of 2 meters (6.6 ft) onto concrete (MIL-STD-810F-516.5). And LifeProof does all this without ending up with a bulky, clunky case. The iPhone case adds 1/16” (1.5mm) from the center of the phone, and weighs under 1 oz. (28g), so it still travels comfortably in a pocket. You install the case by sliding the iPhone into the body of the case, face down, so the top power button and side volume buttons and mute switch pop into the associated elements of the case. 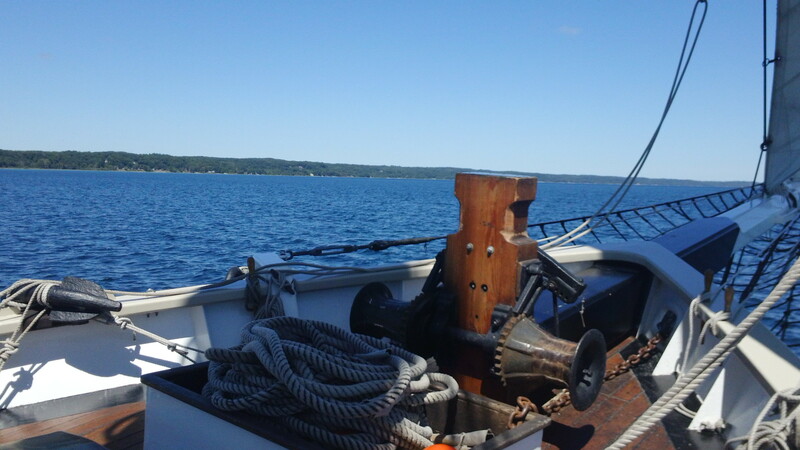 Then snap on the back, and close the bottom latch over the dock connector. Finally, screw in the headphone jack cover, and your iPhone is hermetically sealed, yet still fully accessible and functional. The headphone jack is harder to access if you often use earphones or headphones. LifeProof includes a screw-in headphone adapter, since most typical headphone plugs do not fit into the access above the headphone jack. The power and volume buttons are covered, but still easily usable. The case has a subtle bumpers on the side to protect the buttons. The front and back cameras are covered by an additional window. LifeProof uses double AR-coated optical glass lenses, and I have not noticed any problem with loss of clarity. The case also covers the iPhone speakers, but again I have not noticed a big deal, and LifeProof even claims that it improves bass and mid-frequency using the back of the case as a sub-woofer. So while I have chosen to not deliberately drop or submerge my personal iPhone, the LifeProof case certainly has done its job in protecting the phone through the travails of normal life, including winter snow, hot and dusty Texas spring, damp and humid ocean and lakeside beaches, and several heart-stopping accidental drops. 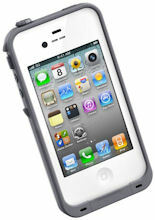 The LifeProof case for iPhone 4/4S is available for $79, in black, white, and a variety of bright colors. Whatcha looking at? With the Pivothead Video Recording Sunglasses you can capture the scene and the action in videos and photos -- as you look around. Pivothead actually has several lines of stylish sunglasses, some with interchangeable lenses (gray, yellow, clear; polarized and not), or you can order prescription versions. But these glasses also sport a camera lens at the center of the bridge between the lenses, plus slightly oversize areas on the front of the arms for the electronics, behind the hinge. So go ahead and look around, or head out on a bike ride, and the glasses will shoot as you go. And this is not crummy, low-res video -- It's stunning quality 1080p HD quality, plus 3 MP photos. And you can take photos at the same time that you are shooting video. Of course, you do have to think about the viewer for your video -- Watching the viewpoint of someone else's bopping head can be rather disconcerting. Actually, watching even the natural motion from walking can be troublesome, while it seems fine to the person who was wearing the glasses. The glasses are easy to control. Power them on from the side, and then push the video/photo toggle on the left side to start/stop recording and to shoot photos. To access your videos and photos, connect to your computer through the microUSB port, and copy the files as you would from any external storage device. The Pivotheads have 8 GB of onboard memory, enough to store approximately 60 minutes of 1080p HD video. Amazingly, the Pivothead glasses actually support a wide range of video and photo shooting options, including resolution, auto focus and exposure modes, macro and ISO levels, burst / time lapse photos, and face tracking. You can change the video res and shooting mode though button presses, but it's a lot easier to download the Control Settings Dashboard Software for PC or Mac. Even with today's ubiquity of cameras and camcorders, the Pivothead glasses bring even more fun and freedom to shooting your activities. They're an impressive combination of design and function, ease of use and customization. The Pivothead Video Recording Sunglasses are available for $349 in 4 models and 16 styles. Take a look. See my summer update on gadgets -- Portable Accessories - Mid 2012 -- for more on portable devices and accessories. Yawn! -- Does anyone still care about iPods? After all Apple, reports that iPod sales have declined 10 and then 15 percent in each of the last two quarters. On the other hand, iPods still can be a nice business for Apple, as during those same quarters Apple sold 14.5 million units. And the iPod brand dominates the market -- when was the last time you heard of another music player? As a result, Apple has been happily selling its previous iPod nano generation 6 and the iPod touch gen 4 since Sept. 2010, and is still selling the iPod shuffle gen 4 from Sept. 2010, as well as the positively antique iPod classic from back in Sept. 2009. The iPod touch has a clear place in the product line -- as a Wi-Fi iPhone without the phone part, or as a mini-iPad (especially in the absence of an in-between size tablet). The touch provides conveniently portable access to the Apple iOS world, including iTunes music (26 million songs) and videos (45,000 films), and all those 700,000 apps -- including over 175,000 game and entertainment titles that help make the touch an attractive handheld gaming device. Plus, it's a Wi-Fi device for web browsing and email and other cloud access. The new iPod touch (generation 5) basically catches up with the previous-generation iPhones and iPads, with the bonus of a 4-inch widescreen Retina display (same res as the iPhone 5, up from 3.5"). It also features a 5 MP iSight camera (vs. 8 MP on the iPhone 5) with full 1080p HD recording, Apple's A5 processor (like the iPhone 4S and iPad 2), and even the Siri voice-input intelligent assistant as part of the upcoming new iOS 6 release. The advantage of the iPod touch is that, even as a flexible multi-purpose device, it's so thin and light -- shrunk from 7.2 to 7 mm thin, and down from 101 to 88 grams, even though it's slightly larger in the widescreen aspect ratio (4.86 × vs 4.4 in. tall by x 2.3 in. wide). As it often does, Apple has held the same pricing for the new magic -- 16 GB for $299, 32 GB for $399 (no more 8 GB), now in a broader range of colors (pink, yellow, blue, white & silver, and black & slate). See my Apple iDevices Gallery for more details on the current -- and past -- Apple iOS devices, including the iPods, iPhones, and iPads, as well as product chronologies. For a company known for its clearness and certainty of vision, Apple has shown an amazing variety of takes for the different versions of the product it calls the iPod nano. After all, the iPod shuffle is clearly the minimalist clip-on music player without a display, while the iPod touch is clearly the entry to full-fledged iOS devices (see previous post). But what kind of player is in between basic and iOS? Should it play video, as well as music? Should it have a camera for photos or videos? Should it be a multi-function device, but for what, without the Apple iTunes and App stores? Does it need a touch interface, or just a click wheel? And is the screen just for choosing music, or for more sophisticated functions? Apple has answered yes to all of these alternatives over the multiple generations of the nano, with its last full refresh in 2010 (see earlier post). And now it has changed again with the announcement of the nano generation 7. The original nanos from 2005 and 2006 were click-wheel music players, with a simple 1.5 inch display for choosing music, plus built-in games, calendar, contacts, and notes. As memory sizes were expanding into multiple GB, players really needed go beyond the shuffle to add a display so that you could reasonably access thousands of songs in a handhold device. With the nano generation 3 in 2007, Apple upgraded the nano to a full-fledged video player with a 2 inch color display with the same resolution as the iPod video. It also provided more advanced interface features like Cover Flow to flip through album covers. With the emphasis on video, the screen stretched in landscape mode, so the overall look went from thin to wide. But just a year later, as the iPhone added the App Store to become a customizable platform, the nano gen 4 shrunk back down to tall and narrow, with a smaller 2 inch display. The new theme was focused on an especially sleek and thin design for music and video playback. Then the nano gen 5 from 2009 kept the same design, but stepped back up even closer to iPhone/touch kind of capabilities as an almost-but-not-quite iOS device, keeping the narrow design but adding a slightly larger 2.2 inch display plus a video camera, microphone and speaker, FM radio, and pedometer. As a PDA type device, it also supported clocks, alarms, and stopwatch, and could sync contacts, calendars, and to-do lists with iTunes. But in 2010, Apple swung totally in the other direction, revamping the nano gen 6 as a shuffle-style music player, but trading in the control pad for a touch-screen display. The new design had the shuffle's rectangular shape, with a 1.54 inch display over the entire area. The miniaturized nano also lost the camera, mic, and video playback, but kept the FM radio and pedometer. The refresh a year later further emphasized the fitness features. The 2.5 inch Multi-Touch display is smaller than the other 4" devices, and significantly lower resolution (432 x 240 vs. 1136 x 640). But it's now once again a serious photo viewer and video player. The nano continues the FM radio and pedometer, but still omits a camera. But besides the display, the biggest addition is Bluetooth support to play your music wirelessly to headphones, speakers, and cars. 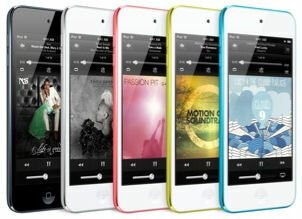 The result is viewable player in a thin and light design -- the "thinnest iPod ever" at 5.4 mm, and 3 x 1 1/2 inches. Apple reports that the battery supports up to 30 hours of music playback, and 3.5 hours of video. 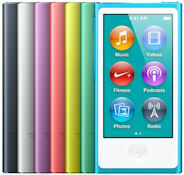 The new iPod nano gen 7 is available for $149 with 16 GB of storage, in a profusion of colors -- pink, yellow, blue, green, purple, silver, and slate. You may know Brookstone from its amazing variety of electronic gadgets that you never knew you needed, or that you suddenly found out that you really did need at the airport. But Brookstone has been doing some interesting new product development as well, as demonstrated by its Big Blue Audio brand -- with a pair of interesting Bluetooth wireless speakers to play music from your phone or tablet or computer. The flagship Big Blue Studio is the table-top model (~ 9 1/2 x 5 1/2 x 5 inches and 6 1/2 lbs. ), with two full-range speaker drivers (for stereo highs and lows) plus a subwoofer and passive radiator for bass. It pumps out 30W, 7.5 per channel plus the 15W subwoofer, and is priced at $149. The smaller Big Blue Live is mini enough to pack for trips (~ 5 x 2 1/2 x 2 1/3 in. and 1.4 lbs. ), but large enough to pack stereo speakers for a strong sound, plus a down-firing passive radiator for bass, with a total of 4 W.
It's cordless, adding a rechargable battery for up to six hours of use on the go, plus a microphone so you can use it as a speakerphone. I particularly appreciate the clear controls, with six distinct buttons on the top: power, volume up/down, forward/back, and phone/play control. Nicely, the forward/back buttons can be used not only to skip to the previous/next track, but also to scan within the track. The Big Blue Live is great for desktop use, providing strong and clear sound. It's priced at $99. See my update on gadgets -- Portable Accessories - Mid 2012 -- for more on portable devices and accessories. Entries posted to Manifest Tech Blog in September 2012, listed from oldest to newest.